The Development Office and OB Club work in close partnership with the ultimate goal of supporting Blundell’s School. 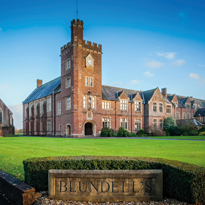 Both organisations believe that Blundell's possesses a unique ethos that is passed on to all those who study or work here. By working in collaboration, both organisations can help to preserve this ethos by ensuring the continuing success and prosperity of the school. To support the Blundellian Community. Communicate with the Blundellian Community and distribute a postal or electronic copy of The Diary to those that wish to stay in contact. Cultivate goodwill amoung the Community and sustain the tradition of benefaction that has been central to Peter Blundell’s wishes. Support identified projects including bursaries for pupils and capital projects. To promote the reputation and status of Blundell’s - locally, regionally, nationally and internationally. Maintain the demand for pupil places at Blundell’s. Encourage high calibre staff to be part of Blundell's.